Australian endurance explorers James Castrission (“Cas”) and Justin Jones (“Jonesy”) first garnered international attention in 2008 for “Crossing the Ditch.” The phrase refers to kayaking across the Tasman Sea from Australia to New Zealand, a 2-month, 3318-kilometer, never-before-completed journey. Flushed with success, they looked about for another challenge and hit upon Antarctica. Though there had been several attempts to walk from the coast to the pole and back (2200+ kilometers), unsupported by dogs, wind sails, motors, etc., none had ever made it. Cas and Jonesy decided to give it a shot… but first they must learn how to ski. The documentary Crossing the Ice covers their preparation and journey, filming themselves as they drag sleds loaded down with food, supplies, camera equipment and a tent across endless vistas of frozen emptiness. 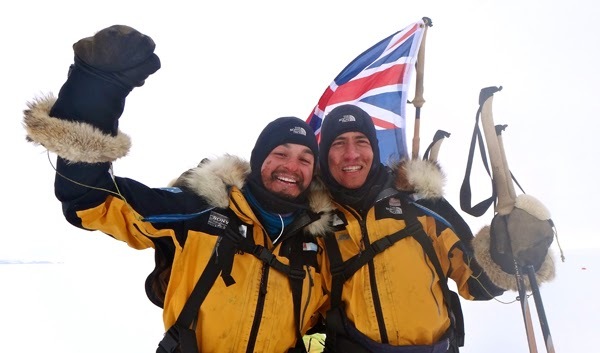 The duo set out almost exactly 100 years after the famous race to South Pole between British explorer Robert F. Scott and Norwegian Roald Amundsen. That one ended badly. Scott lost to Amundsen and his entire team died on the return trip. As Cas and Jonesy approach their starting point they learn that, as though history is ominously repeating itself, a better-trained lone Norwegian, Aleks Gamme, has already set out ahead of them. Cas and Jonesy immediately run into trouble. They are delayed for weeks by a raging gale-force white-out. They suffer doubt, sickness, frostbite and a festering rash from the laborious and repetitive motion. But they push on and eventually encounter Gamme already on his return trip. He is the first human they have seen in months and their highly anticipated meet-up is the film’s most hilarious moment and one of its most terrifying. They finally make it to South Pole Station weeks behind schedule and must face the temptation of quitting (hot showers, fresh food, rest! ), but they stoically circle the pole and trudge onward, now severely rationing and dangerously losing weight. They can only accept that Gamme will handily secure the historical honor of being first and, much worse, they must face the prospect of death as they search unsuccessfully for waypoints (now obscured by snow) where they buried food for the return trip. Crossing the Ice is a short, truly heart-pounding adventure documentary that would be interesting enough for its footage of such a desolate corner of the globe, but it’s made compulsively watchable through our instant sympathy with its real-life protagonists. You can’t help cheering on the good-humored, risk-taking best friends and their thoroughly insane scheme, yet the even crazier Aleks (who it turns out is also documenting the trip, too, along with a ‘friend’) steals several unforgettable scenes. He’s also responsible for the story’s most emotional twist, which actually left me teary-eyed! To get the footage Cas and Jonesy desired they often had to set up the camera, backtrack, and then pass in front of it, slowing themselves down and increasing their travel distance in the name of pioneering filmmaking. Their discerning editing has a thriller sensibility; rapidly paced yet keeping the viewer in constant suspense. We feel the danger, the tension, the psychological strain. We shiver in reaction to their cold. And we realize that we can only just barely fathom the loneliness, monotony and marathon endurance involved. Crossing the Ice ultimately invokes two forms of awe: one for the inhuman indifference of nature so vividly manifest on Antarctica’s inhospitable surface and one for the inspirational power of human endeavor and the untapped potential that lies within us. I hadn't heard of this one yet, but it sounds amazing. It's going straight to the top of my list!